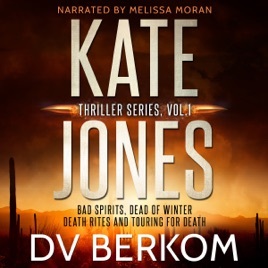 BAD SPIRITS (Books 1-5): Kate Jones is on the run with a backpack full of money, intent on finding her way back to the United States from Mexico. Unfortunately, a ruthless drug lord named Salazar is just as intent on finding her, retrieving his stolen money, and making her pay for ever having left him. Is there anyone she can trust? DEAD OF WINTER: Kate Jones is hiding out in small town Alaska when she witnesses an execution-style murder. Convinced the killers are Salazar's men and desperate to stop them from finding her, she reports the crime to local law enforcement, hoping to put them off her trail so she can escape. DEATH RITES: When Kate has to leave Alaska (and Sam) behind, she runs to the last place she remembers feeling safe: the North Shore of Oahu. Against her better judgment, she re-establishes old connections, and soon faces a new problem in Alek, a gifted carver and avid surfer. ...and the ancient gods of Hawaii. TOURING FOR DEATH: Kate Jones is hiding out from her shady past driving jeep tours through the rugged high desert of northern Arizona, determined to stop looking over her shoulder and find peace from her mistake of a gun-toting, former life. Testifying against a Mexican drug lord and a dirty DEA agent didn't turn out to be a life enhancing choice and she's been on the move ever since. Now, five years have passed with no sign of trouble and Kate's finally starting to believe she's safe. Her current goal is to make enough money so she can get lost in the tropics when the tourist trade dies off. Unfortunately, it's the tourists that are dying off and she may be next.